You will usually catch me singing. Sometimes I am playing keys or leading worship. Long ago the prophet Malachi prophesied of a day when every place on earth will have the incense of worship and prayer arising to the throne of God. This prophecy is beginning to be realized in our day. Worldwide prayer and worship will continue to build to the Second Coming of our Lord Jesus. IHOP Kansas City wants to play our small but important role in this worldwide movement. 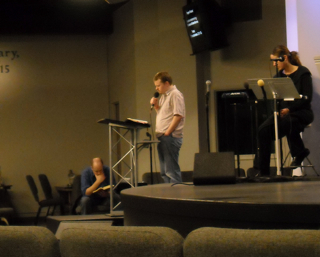 Our leadership decided in December to begin making our Prayer Room webcast available to the world free of charge. We had been charging a small monthly subscription fee, but we realized that this fee cut off many in third world nations and even teenagers in our own nation who need access but do not have a credit card. This also means that you can watch the sets that I am helping lead in the Nightwatch. In addition to the live webcast, we also have archives of the last 48 hours of prayer room sets. The Prayer Room webcast is great to pull up during your quite time with the Lord, while you wash dishes, or even quietly in the background while you work. Recently, several IHOPU students traveled to New England for 40 days seeking to see the same Awakening that has been touching Kansas City touch New England. There is five-minute video about what all God has been doing. Check it out! This coming Friday, we will begin our Bound4LIFE KC silent prayer siege season again. Bound4LIFE KC will be praying silently seven days a week in front of Planned Parenthood. I will be leading Friday’s prayer siege. I am excited about getting to pray again for the ending of abortion. I know God is doing so much! Sunday at 4 am before the infamous vote, we cried out to the Lord for mercy on our nation. A Spirit of intercession really gripped the room as we cried out for mercy and for the bill’s defeat. Though the bill was not defeated, I am thankful that President Obama issued his executive order. This order will hopefully (aside from potential judicial action) keep funds away from abortion for at least the remainder of President Obama’s term. After that, we will have another battle ahead of us! We have praying in the Nightwatch with our President Obama Prayer Team for him almost every day since he was elected. Even if it was just political maneuvering, I am glad that God moved on his heart. Please continue to pray for him and our congressmen. Awakening has to touch Washington DC!